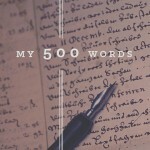 I’m taking part in Jeff Goins’ 500 words challenge. You can read more about it clicking this link. He’s an amazing writer and one of the main inspirations for this blog. I can’t wait to get stuck in, and in fact, for the last 6 days, I’ve written solidly – not always 500 words, but often close to, or even more than 500 words. I do most of this with pen and paper (go analog!) and plan to publish at least three times weekly on this blog. Maybe, I can even publish every weekday. What about you? Will you read on, click on, or write on?